Free Shipping Included! Glyph Studio mini (USB 3.0, FW800, eSATA) (2TB (5400RPM)) by Glyph at Pacs BG. MPN: SM2000B. Hurry! Limited time offer. Offer valid only while supplies last. Unlike off-the-shelf hard drives, Glyph actually designed their Studio mini with the intense demands of professional media production in mind. Unlike off-the-shelf hard drives, Glyph actually designed their Studio mini with the intense demands of professional media production in mind. Spinning at 5,400rpm, these hard drives support massive track counts, high-resolution sample streaming, and HD video. FireWire 800, eSATA, and USB 3.0 equip the Studio mini for today's computers while providing backwards compatibility support for when you need to connect to legacy machines. Dead-silent heat-transfer technology draws heat away from internal components and moves it to the aluminum exterior to dissipate, greatly reducing the chance of component failure. 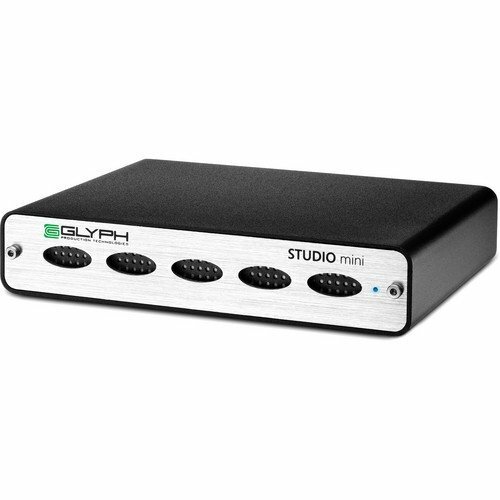 And, in addition to a disk-health monitoring system, the Studio mini carries Glyph's 3-year warranty for total peace of mind.